World Bank arm’s rupee-denominated borrowing surges to top 5 in FY15. Two years back, India did not figure in the top five in the local currency denominated borrowings of IFC. The concept of rupee-denominated bonds or “masala bonds” seems to be gaining currency, aided in good measure by rupee bond offerings made by the International Finance Corporation. IFC, an arm of the World Bank and a major global financial institution that fosters private sector development in developing countries, has seen its rupee-denominated borrowing in international markets during fiscal 2015 (year ended June, 30, 2015) surge to the top five in currency terms, nearly comparable to its yen-denominated borrowings and actually higher than its borrowings denominated in the renminbi. Two years back, India did not figure in the top five in the local currency denominated borrowings of IFC, which has the distinction of being among the first multilateral institutions to issue bonds in the local currencies of emerging markets. IFC’s borrowing in rupees in FY15 was $646 million, or 4.1 per cent of its overall international borrowings, just short of its borrowings in Japanese yen — $690 million or 4.4 per cent or total borrowings. 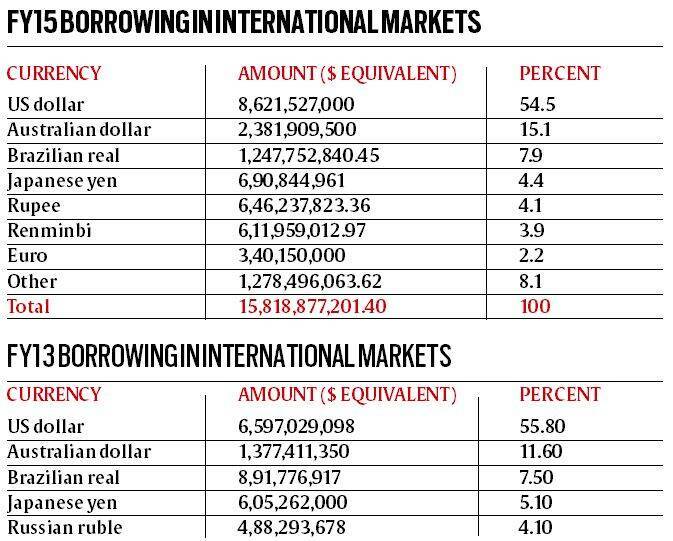 The predominant chunk of IFC’s international borrowings are denominated in US dollars. Local currency denominated bond markets are an alternative source of debt financing for the public and private sectors. Unlike external commercial borrowing or ECBs, the Indian borrower issuing such bonds is not exposed to any currency risk and therefore, the local currency bond markets can contribute to financial stability by reducing currency mismatches and extending the duration of debt. It needs to be mentioned that the rupee borrowings are reflective, in a large way, of the IFC’s overall country exposures, where India tops in terms of committed percentage of the institution’s global portfolio as on June 30, 2015. India had a commitment of $4.81 billion or 9.54 per cent of IFC’s country exposure during the year, followed by China, $3.61 billion (7.16 per cent), Turkey $3.17 billion (6.30 per cent) and Brazil $2,52 billion (5 per cent). In India, IFC has, over the past two years, rolled out what has grown into a $5.5 billion rupee-denominated bond programme that is aimed at boosting funding for roads, power, and airports. In November 2014, IFC issued a ten-year, 10 billion Indian rupee bond (equivalent to $163 million) to increase foreign investment in India. The “IFC Masala bonds” marked the first rupee bonds listed on the London Stock Exchange and were issued under the institution’s $2 billion offshore rupee programme. This followed earlier offshore rupee issuances by IFC at three-, five- and seven-year maturities. The vast majority of investors in the bond were European insurance companies. IFC invested the bond proceeds in an infrastructure bond issued by Axis Bank, an IFC client. “We played a catalytic role in deepening India’s capital markets, introducing an offshore rupee-denominated bond programme whose success prompted the Indian central bank to consider permitting local companies to issue similar bonds in offshore markets,” Jin-Yong Cai, IFC executive vice-president noted at the launch of the Masala bond programme. IFC’s new borrowings totaled the equivalent of $15.6 billion in FY15. In all, IFC has issued bonds in 17 EM currencies and has extended local-currency financing in more than 60 currencies— through loans, swaps, guarantees, risk-sharing facilities, and other structured and securitised products.